December 12, 2002: Our VP Harold Adams showed us some of the fun and interesting ways we can use our Macs to create our own home-made videos. Harold got us into the holiday mood with music playing softly in the background. 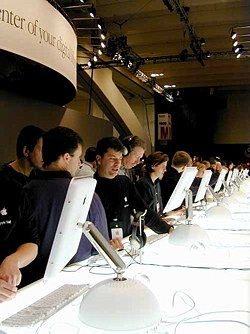 The music was recorded on an iPod with the iTunes software that comes with recent Macs, and played by the iPod through small powered speakers set on the stage. Harold Adams has fun making movies with iMovie and iDVD. Harold brought all the files for his presentation on a FireWire hard disk drive about the size of a small paperback book. A few seconds after plugging it into the iMac, the disk appeared on the desktop and we were ready to start. With a digital video camera plugged into the iMac, Harold showed us how easy it is to import and edit a video with iMovie. We watched as Harold took a seven-minute sequence of his kids playing basketball and reduced it down to about sixteen seconds of fun stuff, added effects (“washout”, slow-motion, fade-to-white), then assembled the various clips into a sequence with cross-dissolves simply by dragging and dropping thumbnail images of the clips into a timeline. Another timeline was added for the soundtrack, and music was added in place of the live sound from the video. Next, Harold showed us how to put the movie on a disk using iDVD. Up to six movies can be put into a preview window. The movies are shown as animated “thumbnail” images, but the animations can be frozen at selected frames to serve as illustrated buttons. For the preview thumbnails, Harold selected background music and a background image from a variety of themes, and added a title in an appropriate font. iDVD also showed us the television “safe area” by shading the outer “overscan” area, the part that’s normally hidden off the edges of the TV screen. iDVD can put up to 60 minutes of MPEG video on a DVD at maximum quality, or up to 90 minutes at “very slightly reduced” quality. Thanks to Mike Bishop of MacMechanic for bringing the iMac for the presentation! Ken Jurgensen gets ready for the presentation. November 21, 2002: Tax time is approaching! Yes, I know we have all the Holidays first — but April 15 will come much sooner than we expect or, for that matter, wish for. Why not be prepared this year? Even if the shoe box looks like your beloved iMac or PowerBook these days, you can still benefit from Quicken by Intuit for personal use, or FirstEdge or AccountEdge by Managing Your Own Business (MYOB) for small businesses. Our illustrious, industrious, and personable President, Ken Jurgensen, gave us a head start on tax preparations by demonstrating these programs and answering our questions. Ken is an accountant by trade when he is not our SBMUG leader, and is well versed in these applications and their use. Ken says, “As most of you know, Quicken is a personal finance application which allows you to do anything from basic check-writing to tracking investments. Alphabet cookies on the refreshments table. “MYOB has been making accounting software for small businesses on the Mac for over a decade. A few years ago they changed the name of the software from MYOB to AccountEdge, and just recently released AccountEdge 3. MYOB continues to enhance its program and there are many new useful features. 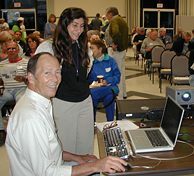 October 17, 2002: SBMUG’s program chairman Morri Glaser gave a presentation on Jaguar, the new 10.2 version of Mac OS X, and a free copy valued at $129 was given away in the drawing. Referred to by its code name, Jaguar, Mac OS X v10.2 combines the rock-solid reliability of UNIX with the ease of use of Macintosh. This version of Mac OS X is loaded with over 150 compelling new features — like instant messaging that’s compatible with AOL’s, an enhanced Mail application that lets you filter out junk mail, an address book that’s an activity center for all your contacts, and a full-featured search engine so useful that you’ll soon feel lost without it. September 19, 2002: Shawn King, host of Your Mac Life, gave us his wacky, fun view of the world. Your Mac Life is a live “radio” program about things Macintosh, but on the Internet rather than on the air. It’s accessible anywhere the Internet is, with listeners calling in, e-mailing, and instant-messaging from around the world. About 1500 listeners hear the program live on Wednesday nights, with about 140,000 listeners downloading the archived programs during the month. Shawn interviews guests from such companies as Adobe and Apple, including Apple cofounder Steve Wozniak. He also broadcasts from the various Macworld Expos throughout the year, and recently the Apple Expo in Paris, France. Shawn presented a slide show of the Expo and the surrounding countryside. We had to be out of the auditorium promptly at 9:00 p.m., but Shawn kept us entertained a while longer with an impromptu chat in the parking lot after the meeting. August 22, 2002: Our panel of experts (Morri Glaser, Becky Davis, Harold Adams, and Bob DeLaurentis) fielded all questions about Macintosh. The free-form discussion covered many topics and never slowed until the end of the meeting. Then we had the drawing, and happy winners took home a copy of Jaguar (OS X version 10.2 donated by MacMechanic) and an Apple iPod. July 18, 2002: Kent Silveira from Creative Data Design showed examples of what the cross-platform database program FileMaker Pro can do. His fancy layouts, which display one or more records of data in a window, were displayed on screen as he answered a range of questions from the group. June 11, 2002: SBMUG Program Chairman Morri Glaser showed us Apple’s iTunes music software and the iPod MP3 music machine. We also had a drawing for a new iPod, and Donald Burr was our happy winner. He writes about his experiences with the iPod in the September-October 2002 issue of SBMUG’s Mouse Times. Among the new features in Photoshop Elements are a File Browser that makes it easier to find the right image by displaying small previews before the images are opened. Once the image is opened, an Options bar at the top of the window displays option menus for the active tool, changing as each different tool is selected. A new Crop tool makes cropping much easier, and Print Preview shows how the image will fit on the paper. Photoshop Elements also makes “contact sheets” — collections of “thumbnail-size” images that can be printed out on a single sheet of paper. A collection of images can also be quickly made into a Web Gallery page ready to put on the Internet. What’s missing in Elements are features most people don’t use, such as CMYK Mode, Channels, and some text features. Delicious refreshments on the food table before hungry SBMUGers ate them all up. Tom and Sandy will be teaching classes in May and June 2002 at Grayphics Typesetting & Design in downtown Santa Barbara. After that they’re moving to Florida, but we hope to have them back again in the near future. You can find them on the Internet at tomtuttle.com and sandynovak.com. They also have a free training website at MetaPhotos.Com. 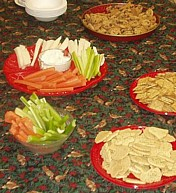 As usual, we had well-stocked food tables for refreshments during the breaks. Thanks to Guy Demangeon who donates the fruit and vegetables from The Berry Man and Vicki Fletcher who donates baked goods from The Good Earth, and to Becky Davis and all our refreshments volunteers for setting up the tables, making coffee and keeping us refreshed! April 18, 2002: Morri Glaser demonstrated iTools, Apple’s free tools and services that give Mac users a professional way to backup or share photos, web pages, or files. Morri showed us how easy it is to set up a free iTools account, with access to Webmail, iDisk, iCards and HomePage. Webmail gives you access to your messages from anywhere on the Internet, no need to wait at home! You can fashion a virtual picture postcard to send to friends with iCards — just pick a postcard picture, type in a message and some addresses, and send it off! iDisk is a 20 megabyte storage space you can use for backing up or for making files available to others. It includes a public folder, which can be password protected to limit who has access. Make an iMovie and put it on the server, with your choice of a theme or no theme. Tell your friends about it; they’ll be able to see the iMovie as streaming video! 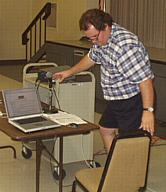 Harold Adams shows how to make your own digital videos with iMovie and iDVD software. and even an introduction to Video CD and DVD, both of which can be played on most modern DVD players. Harold used the new flat-screen iMac and the iMovie and iDVD software that came with it. If you’d be interested in joining a QuickTime/iMovie workshop or Special Interest Group, please see the Special Interest Groups page. Left: Morri and Brian present Microsoft Office X.
February 21, 2002: This is the year of X, as in OS X, and the February meeting focused on Microsoft Office X for the Mac. We saw Office X being installed and taken through its paces, with Program Chair Morri Glaser and iProgram-VP Brian Carlin as the capable and daring pilots on this mission. They gladly answered our questions and shared their OS X and Office X experiences with us. January 17, 2002: After the usual Q&A session at 6 p.m., our first official business of the year was to elect this year’s executive board. You’ll find who’s who on our Contact SBMUG! page. 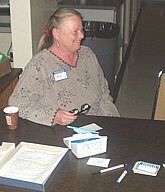 Then came the fun as SBMUG members gave their reports of Macworld Expo 2002 in San Francisco’s Mosconi Center. Mike Bishop, our local MacMechanic, was honored as the #1 Apple dealer in percentage growth west of the Mississippi, and #2 in all of North America! Mike, along with Ben Williamson and David Leston of the MacMechanic, showed us photos of vendors’ booths at Macworld Expo using Apple’s new iPhoto software. iPhoto makes it easy (Mike says “I just plug the camera in”) to transfer digital images from camera to Mac, view them as thumbnail images in a “contact sheet” format, and make them into a slide show. Like the icons on OS X’s dock, the images on the contact sheet grow as they are pointed to, making it easy to find the one photo you’re looking for. iPhoto also makes it easy to remove “red eye” caused by the camera’s flash: just select the eyes and select “Remove Red Eye” from the menu. Naturally, all the camera manufacturers were at this year’s Macworld Expo. Mike also reported that a vendor has created a way to use the popular iPod MP3 player as a remote control for all sorts of things! Our new president Ken Jurgensen went to Apple’s Mac User Group University and exchanged ideas with other MUG leaders. Guest speaker on the last day of MUG University was the original Mac Evangelist, Guy Kawasaki. Ed Togami brought along little Kenzie, who attracted attention as he expertly played games on the new iMacs. Ed made an iMovie in QuickTime and e-mailed it home. San Francisco’s public transportation is so good it makes sense to find a hotel room out of town. Sally Gorey told us of visiting with friends and going out for an organic salad. Right across the street was the Apple Store. Thanks to all who went to Macworld Expo and brought back news and pictures!